MVSR Engineering College i.e., Maturi Venkata Subba Rao Engineering College, was established in 1981. It is one of the earliest of the colleges in the state of Andhra Pradesh, India, that pioneered engineering education in private sector. The college was founded by Matrusri Education Society, whose members distinguished themselves as engineers, doctors, accountants, lawyers, businessmen and administrators. The college is also popularly known as Matrusri Engineering College. After completing two decades of excellent service in Technical Education, the college has celebrated its Silver Jubilee year in February 2007. Phone: (08415) 244362, 244867 Fax: 08415 -245180. New Approved Courses during 2010-11.
placements : The college Placement and Career Guidance Cell was established in the year 1997 with Mr. J. Prasanna Kumar, Head, CSE officiating as Placement Officer. The Cell was helpful in the placement of hundreds of students in many prestigious companies in the country. Mr. M.V. Srinvasa Rao, Asst.Prof., CED is the Asst. Placement & training Officer. Faculty members from each department are co-opted as members of the Placement Cell. The Placement & Career Guidance Cell provides special Career Counseling. Any student can contact the Career Guidance Cell to discuss about their field of interest and analyze the possible career prospects. This enables the student in developing his/her career plan. 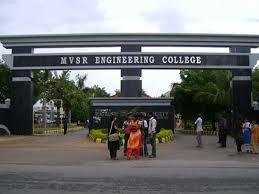 Campus: MVSR Engineering College i.e., Maturi Venkata Subba Rao Engineering College, was established in 1981. It is one of the earliest of the colleges in the state of Andhra Pradesh, India, that pioneered engineering education in private sector. The college was founded by Matrusri Education Society, whose members distinguished themselves as engineers, doctors, accountants, lawyers, businessmen and administrators. The college is also popularly known as Matrusri Engineering College. After completing two decades of excellent service in Technical Education, the college has celebrated its Silver Jubilee year in February 2007. The college offers degree courses in a variety of disciplines of engineering, three PG programmes in engineering, MCA and MBA. It is also the first non-minority college in the state to offer Automobile Engineering. The total student strength at present is over 2800. There are 175 well-qualified faculty and 200 technical supporting staff.The college was initially situated at Saidabad, Hyderabad, and was fully shifted to the present sprawling campus at Nadergul, Hyderabad. The departments are housed in separate buildings and have very well established laboratories.The college is regarded as one of the premier institutes for engineering education in the state of Andhra Pradesh.